DALLAS (Oct. 23, 2018) – Ever wondered what it's like to delve deep within a South African cave to discover and recover some of the most famous ancient human fossils in scientific history? The opportunity is now at your fingertips – and it's free via the Apple App Store and Google Play! Internationally renowned paleoanthropologist Professor Lee Berger and Perot Museum of Nature and Science leaders, in partnership with South Africa's University of the Witwatersrand (Wits University), today announced a world-first virtual reality (VR) app to view "bones that are shaking up our family tree." Berger – who recently dominated world science headlines with his discovery of Homo naledi, a new species of human relative – was joined by Perot Museum CEO Dr. Linda Silver and Perot Museum research scientist and Director of the Center for the Exploration of the Human Journey Dr. Becca Peixotto for a Facebook Live news conference watched by journalists and academics from across the world. The free app, which is optimized for Google cardboard but compatible with any headset, allows people all over the globe to virtually tour the cave that very few people – including "underground astronaut" Dr. Peixotto – have visited in person (due to the extremely narrow, 8-inch "chute" through which it is accessed). "As I would never be able to actually get into the Dinaledi Chamber, one of the most exciting things for me, personally, is that through the Dinaledi app I can actually see and experience what it is like to be in the Chamber where these wonderful discoveries were made," says Berger. "And, even more exciting, I can share this first-time experience with young fossil hunters from all over the world." The Museum collaborated with Wits University to initially create this experience, which was brought to fruition by Dallas creative-technology company Groove Jones, for the Museum's newly transformed Being Human Hall. However, they also wanted to extend the VR journey beyond the walls of the Museum. Thanks to an app with narration in six languages from some of the actual explorers and scientists from Berger's Rising Star expedition, viewers can explore and even "virtually" hold fossils from the remote cave. The translated experiences are available on the app in English, American and European Spanish, and the African languages of isiZulu, Setswana and Sesotho. "It's important for young people, from the U.S., South Africa and around the world, to see themselves as the next generation of scientists through innovative, multilingual experiences like this," said Peixotto. "I hope that allowing fellow researchers to virtually examine this important fossil site in a different way may lead to exciting, new insights." Today's unveiling comes just six months after the Perot Museum announced its new Center for the Exploration of the Human Journey. In April 2018, the Museum named Peixotto as director and formed a partnership with Berger to serve as the Center's Distinguished Science Advisor. Weeks later, the Museum's Being Human Hall reopened to rave reviews, featuring the popular VR experience of the Dinaledi Chamber (which has since been translated into Spanish by one of the Dinaledi team scientists). In August, the Museum and Wits University, a widely respected public university known for its research achievements, signed a Memorandum of Understanding that launched a dynamic relationship for future international collaborations. Additionally, as part of the Museum's In the Field research initiative, Peixotto will return to South Africa Oct. 25-Nov. 18. 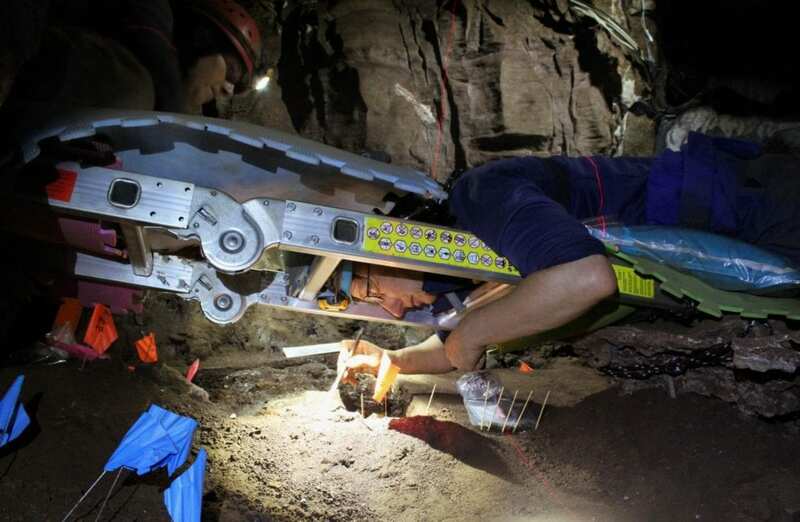 She and the team, including four new "underground astronauts" will return to the Rising Star Cave system with plans to excavate a known fossil area in the Dinaledi Chamber and explore other parts of the cave. Giving real time updates on their expedition, the team may also spend time in the lab with the collection of more than 2,000 H. naledi fossils and revisit a large mass of fossils and sediment extracted earlier this year that potentially contains several dozen remains. To further expand learning opportunities, the Perot Museum is planning numerous outreach programs for students in North Texas and beyond as well as collaborating with National Geographic Explorer Classroom programs for and with students across the U.S., Canada and parts of Europe. The Museum will also collaborate with Berger and Wits University on a major traveling exhibition for fall 2019 that explores the study of human origins and the dynamic research of Berger's and Peixotto's team on H. naledi. The exhibition will invite visitors to celebrate emerging scientific discoveries, experience the thrill of discovering, understand the possibility within scientific analysis, and imagine the future of technology's impact on science. "This virtual reality app and our partnership with Wits University is just the beginning. It demonstrates our desire to communicate in an innovative, engaging way that reduces barriers and makes science exploration universally accessible and exciting," said Silver. "It also represents our commitment to work with international colleagues to advance our collective understanding of the world." The free-to-download app for Android and iOS devices can be found by searching for Perot Museum in the Google Play and Apple App Store. Learn more about the cave exploration experience at perotmuseum.org/DinalediVR. NOTE: To obtain the news release, video, photos and more, please go to perotmuseum.org/press. About the Perot Museum of Nature and Science. The top cultural attraction in Dallas/Fort Worth and a Michelin Green Guide three-star destination, the Perot Museum of Nature and Science is a nonprofit educational organization located in the heart of Dallas, Texas, with campuses in Victory Park and Fair Park. With a mission to inspire minds through nature and science, the Perot Museum delivers exciting, engaging and innovative visitor and outreach experiences through its education, exhibition, and research and collections programming for children, students, teachers, families and life-long learners. The 180,000-square-foot facility in Victory Park opened in December 2012 and is now recognized as the symbolic gateway to the Dallas Arts District. Future scientists, mathematicians and engineers will find inspiration and enlightenment through 11 permanent exhibit halls on five floors of public space; a children's museum; a state-of-the art traveling exhibition hall; and The Hoglund Foundation Theater, a National Geographic Experience. Designed by 2005 Pritzker Architecture Prize Laureate Thom Mayne and his firm Morphosis Architects, the Victory Park museum has been lauded for its artistry and sustainability. To learn more, please visit perotmuseum.org. About the University of the Witwatersrand (Wits) Wits University is a research-intensive University, one of the leading institutions on the African continent that produces world-class research that is locally relevant and globally competitive. Wits is a global leader in the palaeosciences, one of its key research areas. Wits' research output has increased by over 45% in the last four years with more than 85% of its research published in international journals. Wits offers a free space for the exchange of ideas and a vibrant intellectual community that fosters debate and knowledge transfer both within and beyond our lecture halls. For more on Wits' latest research visit http://www.wits.ac.za/research. About Homo naledi. Homo naledi is a newly discovered species of an extinct homonin that was first discovered in 2013 in the Rising Star cave system, near the world-famous Sterkfontein Caves, about 40 km North West of Johannesburg in South Africa. It was unveiled to the world at a ceremony at Maropeng in the Cradle of Humankind in South Africa in 2105. The species has some physical characteristics that are very human-like and others that resemble our more ancient ancestors. Fossils from the find date between 336,000 and 230,000 years old, and were unearthed and described through the collaboration of nearly 150 scientists from all over the world. The original discovery that dominated world headlines was excavated by a team of six underground astronauts, paleoanthropologists and archaeologists who were able and willing to pass through an 18cm wide, 12-metre-long "chute" to get to the dig site in the remote Dinaledi Chamber.